We will leave Cape Town early and travel north up the N7,onwards through the wheat fields and orange orchards to Gifberg near Van Rynsdorp, a welcome stopover that will enchant you. Be prepared for a long haul. 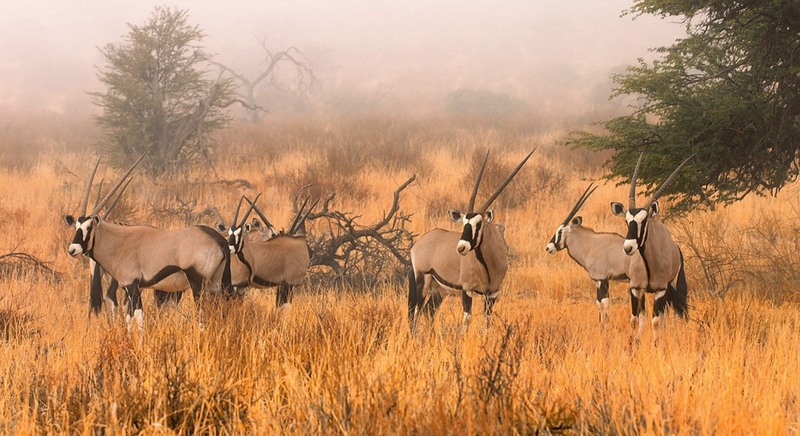 Today we head for the Augrabies National Park that lies astride the mighty Orange river. Our arrivals in the late afternoon, giving you time to view the spectacular Augrabies Falls, where the Orange River crashes through a narrow gorge and down a 56mdrop. At dawn we will enjoy a game drive, where after we tackle the rest of the road via Upington to the Kalahari National Park, arriving in the late afternoon, in time for a refreshing swim and sundowners at Twee Rivieren Rest camp. Night drives are highly recommended (optional extra provided by the Park) and need to be pre-booked, so advise if you wish to go on one. We will spend a further night at Twee Rivieren before heading off to Mata-Mata. On the way we are almost guaranteed to see giraffe amongst a host of other desert animals and birds. We will spend two nights at this rustic rest campon the Namibia border. The camp boasts a good hide overlooking the waterhole.Flocks of sand grouse and doves frequent it regularly. From here we will do regular game drives. We have now crossed over to Nossob, arguably the crown jewel of the park and also the gateway to the Botswana side of the park. Birding at waterholes such as Kubitje Quap are absolutely out of the top draw. This camp also has a great hide overlooking a waterhole and great game drives possibilities both north and south. Now it is time to head back to Twee Rivieren and our last night in the park before the heading south. We will get an early start on the sun and head south as far as Upington before heading west towards Kimberley and the newest jewel in the SAN parks crown, Mokala National Park. Here we will not only kind many rare species of antelope but also many savannah birds. We will take a day's break to explore this pristine wilderness taking advantage of their pool and restaurant. Today we head for the Karoo National Park. We should reach the park by late afternoon and be in time to do a game drive before dinner. We will be up early the following morning which will be the last day of the safari. After breakfast we can do a short game drive before heading back to Cape Town. The home of the red dunes and the raptor capital of Southern Africa.